Melbourne-based entrepreneurs Jamie and Abigail Forsyth are the brother-and-sister team behind KeepCup. Born from a desire to change the way that coffee drinkers use disposable cups, the brand is about sustainability and re-usability. 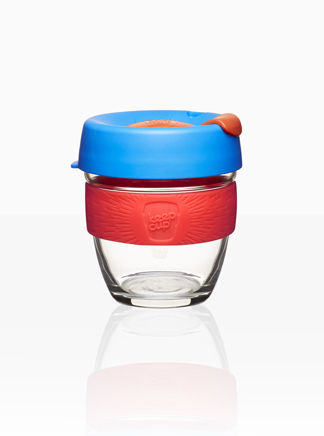 A design solution to an environmental problem, the KeepCup is a barista-standard re-usable cup manufactured in Australia and sold all over the world. Five years after the launch of the original KeepCup at a Federation Square design market, they have released a new design in glass: the KeepCup Brew. Glass was a natural choice for the Brew range. The tempered soda-lime glass is strong, dishwasher proof and contains recycled content. It references the glassware commonly used in cafes, and aesthetically the transparency of the material adds an extra dimension to the design. Keeping sustainability in the spotlight, the glass is able to be recycled at the end of its life. In a global market this is a really important aspect, as glass is one of the few materials for which most countries have established systems for recycling. Design was a key component in the original KeepCup, and that has carried through into the Brew range. New curves have been added to the lid, along with an improved drinking hole, and there is a better angle for nose clearance when you’re drinking on the run. The lid snaps on and off with ease and has an improved splash-proof seal. The crafted aesthetics and proportioned design of the Brew range make it perfect for the trendy ‘coffee purist’ market.